The following ad may be the worst example of poor communication to an intended audience since McDonald's ran its online "I'd Hit It" double cheeseburger ad in 2001. Credo Mobile is what used to be the Working Assets mobile phone service. I like Working Assets. I like what they do and what they stand for and how they're attempting to co-opt the market into helping make changes in the world. 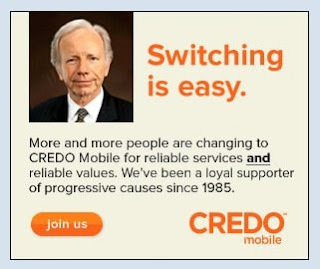 But this is a horrible ad, because speaking as a progressive, the last person I want to see on an ad for things that matter to me is Joe Effing Lieberman. And I really don't want to see it with the tagline "switching is easy," because I interpret that as an insult. See, I didn't take Lieberman's words on the campaign trail lightly. When he blithely suggested that a question about whether President-elect Obama was a socialist was "interesting," I took offense to it. When he said, in his speech at the Republican convention, that "eloquence is no substitute for a record," and that Obama had cut off funding for troops on the ground, when John McCain had voted for precisely the same thing, I took offense to it. And when, after the election, the Democratic caucus voted to retain Joe Lieberman as Chair of the Homeland Security committee when he didn't offer so much as a public apology for his statements, when he so easily switched his allegiance back to the group that he had so vilified repeatedly on the campaign trail, I took offense, not only at the Democratic caucus who let him off the hook, but at him, for making it clear that his personal honor is a joke, that he never gives more than lip service to anything he claims to care about. I'm guessing that Working Assets means this as a tongue-in-cheek joke, but it's falling flat on me right now. It's a little too soon for that kind of humor, especially since Lieberman is in a position where he can do great damage to progressive causes if he desires, and given his recent record, there's no reason to imagine he won't, if only out of spite.